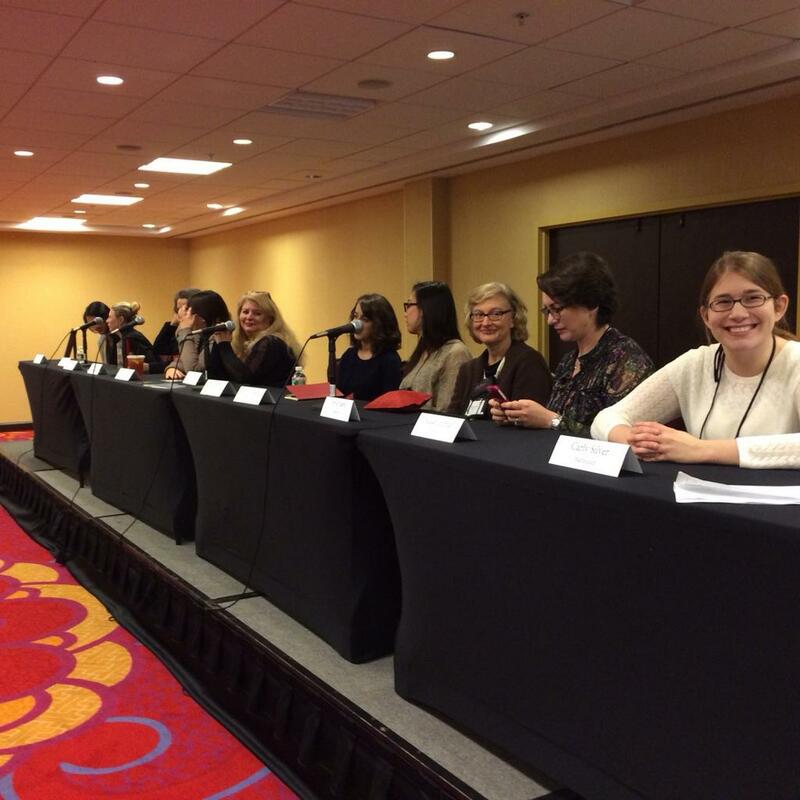 The Editors Panel at the New Jersey Romance Writers Conference, Oct. 18, 2014. The New Jersey Romance Writers annual conference is a treat I look forward to every October, not just for the chance to mingle with fellow writers and attend craft workshops, but also because it’s an opportunity to get a feel for the pulse of the publishing industry. Given its proximity to New York, the New Jersey conference traditionally draws a fair number of editors and agents. Our own Violet Femme Joanna Shupe did a phenomenal job coordinating these expert panels, which are always an excellent opportunity to learn what’s going on in the New York publishing world. More than one editor on the panel mentioned that she’s looking for more romantic suspense, while another said she’s loving cowboys and Amish romance. One panelist mentioned that shorter, grittier romances are a current trend. All in all, there seemed to be a general cooling off toward paranormal, although one editor still wanted to see young adult paranormals. As an historical writer, I was thrilled to hear editorial assistant Nicole Fisher say Avon would never give up on historicals. Lauren McKenna, executive editor & editorial director at Gallery/Pocket books, reiterated her love of the genre, telling writers in the audience that what she’s looking for in historical submissions is something she hasn’t seen before. The editors also touched on how digital publishing’s fast turnaround allows a new author to release books and build a readership faster than with print alone. They also talked about the importance of signing writers who are willing to work with their editors to make their books the best they can be. During their panel discussion following the editors forum, agents stressed that authors, both published and unpublished, should have an online platform and be active on social media because that helps the agents sell their books. The Violet Femmes threw a “Ditch the Heels” evening social on the first night of the conference, which turned out to be a great success. Femme Jaye Marie Rome blogged about the bash last week. Another highlight of the conference for me was the Book Fair. It was my first book signing and it was such fun to meet and talk with readers. I wasn’t sure what to hand out to people who stopped by my table but I eventually settled on candy, custom matches and a post card with a link to an excerpt of my latest release. At my first-ever book signing and the “swag” on the left. People who signed up for my mailing list had a chance to win a copy of Compromising Willa and a carton of custom tea — the heroine of the book blends custom teas so I thought that would be a fun promotional tie in. 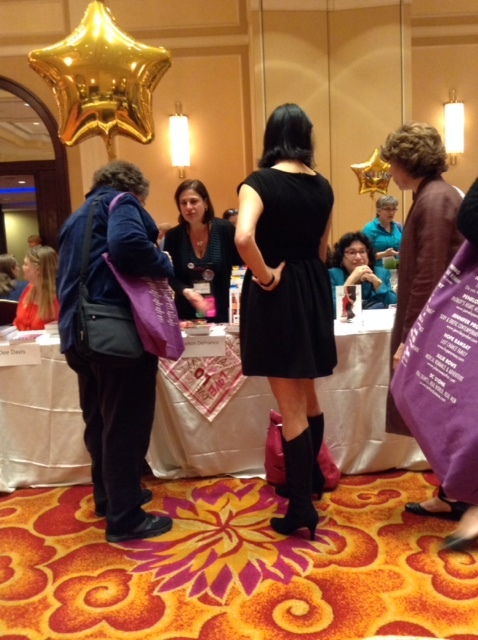 Fellow Femme RoseAnn DeFranco gets busy at the NJRW book signing. 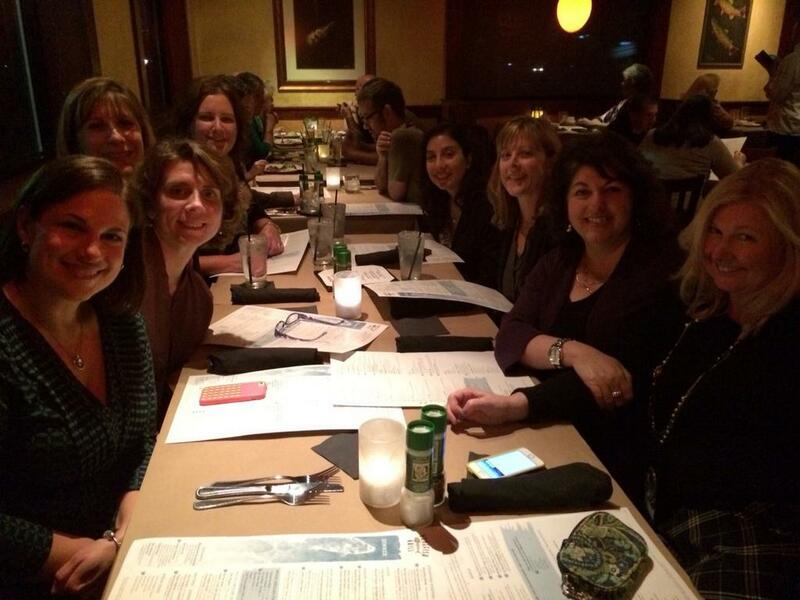 On the final evening, the Femmes went out for dinner at Bonefish Grill. We caught up with each other, gossiped about the industry, and shared details of what we’re currently working on. These gatherings are always special because it’s rare for us all to be in one place at the same time. We definitely made the most of it! A rare opportunity for the Femmes to get together. 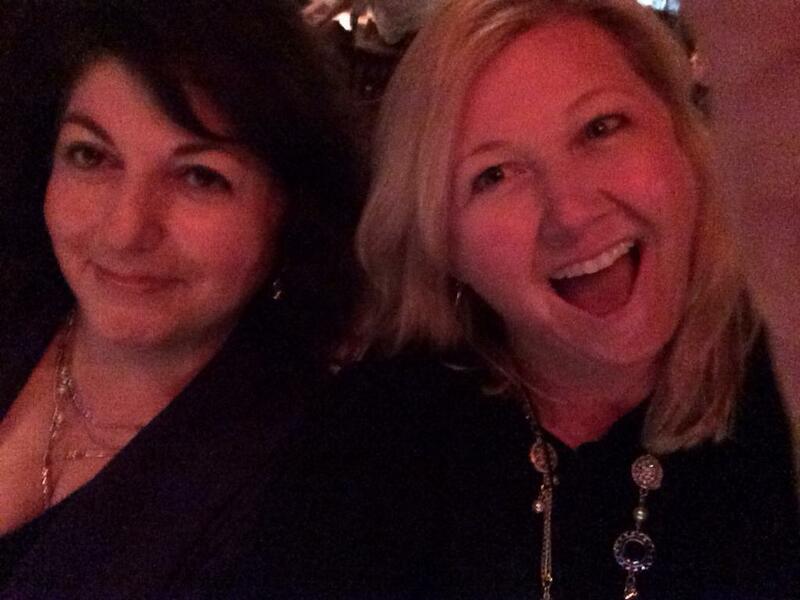 Having fun at dinner with fellow Femme Michele Mannon. On Sunday, we all headed home, but the aftereffects of the conference lingered. I came home super motivated to jump back into my current work in progress. In that way, the NJRW conference is the gift that keeps on giving.